Switzerland is one of those countries that’s always been just outside my peripheral vision when it comes to dream travel destinations. Places like New Zealand, Japan, Costa Rica, Iceland, and Argentina are always front and center when I think about where I want to vacation. Slightly off center are most European countries. However, for some reason, Switzerland never quite comes into focus. Perhaps it’s because I’m not exactly an avid skier. Sure, I would love to ski the Alps someday, but I’d probably be in way over my head like I was in Almaty and end up upset and tumbling down the mountain. Perhaps it’s because they don’t have an ocean. I’m not really sure. Regardless of the reason, I’m very glad I was able to visit Geneva for a few days this week, especially because the trip included some much-needed girl time. My journey to Geneva was a bit crazy. The flight out of Tbilisi was delayed almost three full hours. I only had a 40-minute connection through Munich, so obviously there was no way I was getting on that plane. Lufthansa rescheduled me for a flight leaving in the afternoon, so once I got to Munich I went to a service center for a new boarding pass. Apparently, there was a snowstorm brewing over the Alps, so the extremely nice lady at the desk asked if I wouldn’t mind switching (again) to a flight leaving at 11:15. Thankfully I didn’t check my bag so I was ready for every scheduling curveball, and thankfully my friends on the other end still love me after all the changes. 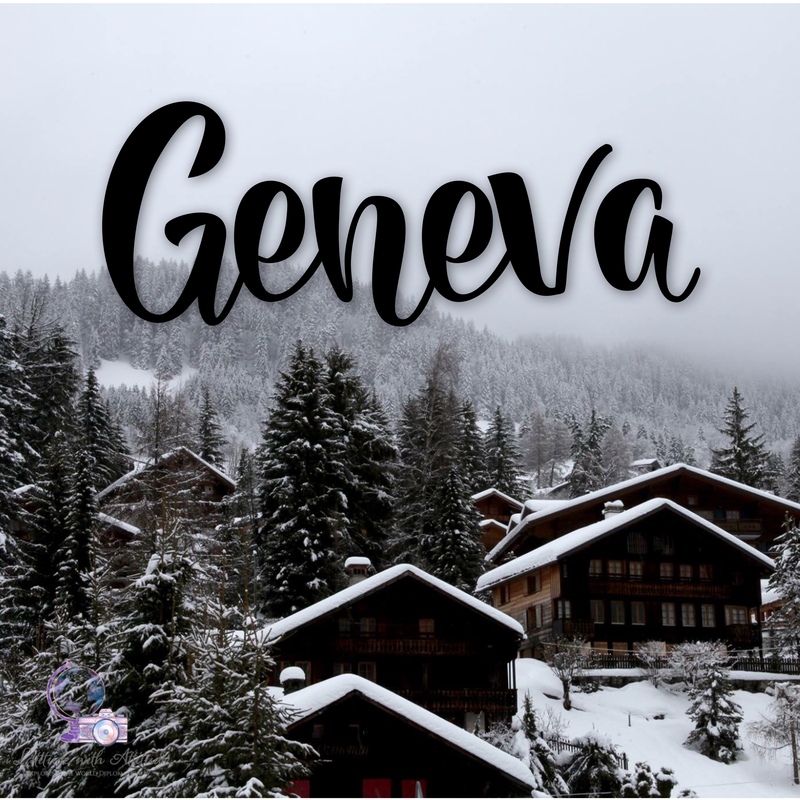 Geneva is not the capital of Switzerland. 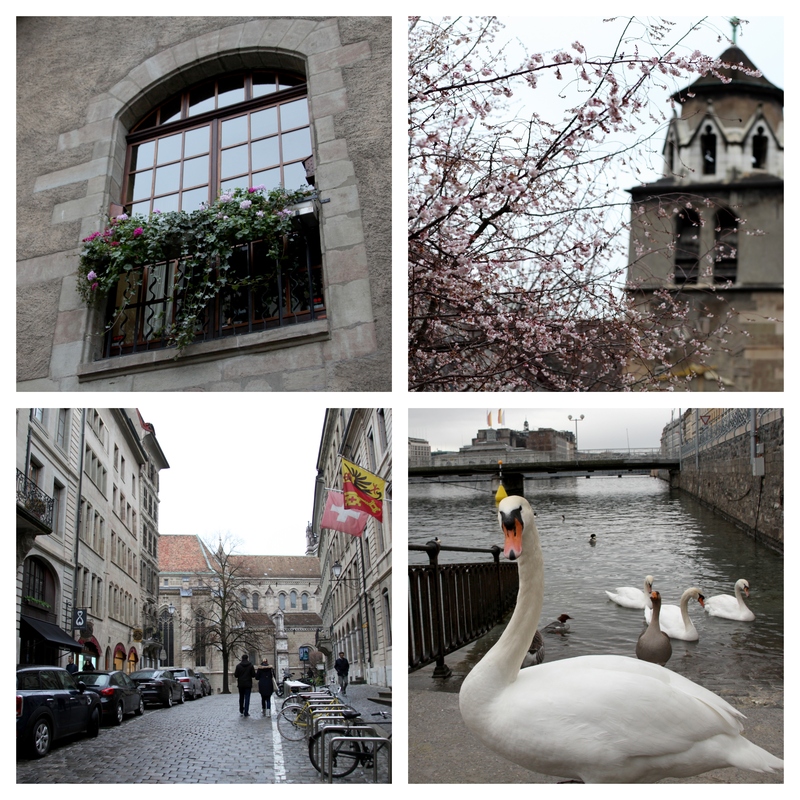 (Zurich isn’t either, by the way, it’s Bern.) It is, however, the Swiss capital of commerce, home to the European United Nations and Red Cross, and one of the world leaders for scientific study with CERN (the European Organization for Nuclear Research) and their Large Hadron Collider. You know, the place where the Higgs Boson particle was confirmed in 2013? No? Just me? Ok…. Some argue that Geneva is exactly the same as any other large European city. To that argument I say: what are you talking about? The city is situated on the southern tip of Lac Léman (Lake Geneva) and offers a stunning view of the French and Swiss Alps, particularly Mont Blanc on a clear day. I don’t think you get views like that just anywhere. It’s also clean, safe, and boasts excellent public transport. Perhaps it doesn’t take much to impress me, but I was pretty smitten with this city. 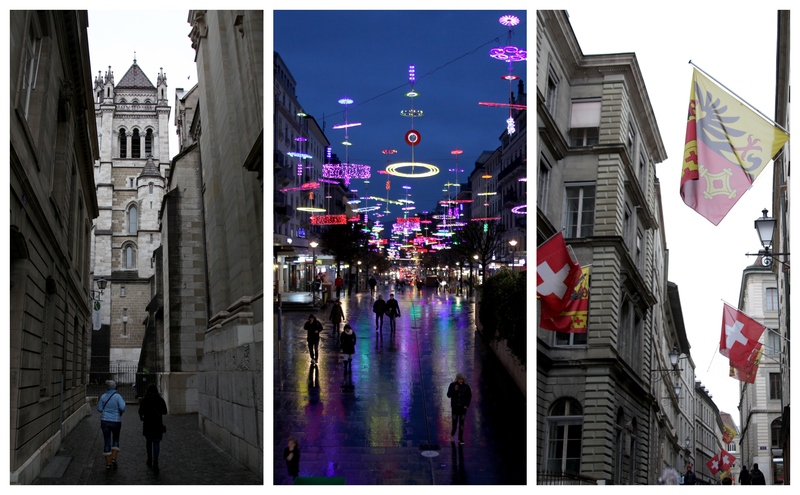 I was only in Geneva for four days, so I didn’t have a ton of time to explore all this city has to offer. We definitely managed to hit the high points: I saw St. Pierre Cathedral’s exterior, befriended (read: didn’t get bit by) some swans, enjoyed a dinner which consisted solely of gruyere fondue, ate chocolate (obviously), and wandered around downtown shops under the lights. We even stumbled upon a street carnival and got some fresh churros. Fairly successful few days if you ask me. For my second full day in Switzerland, our friend who lives there suggested we take the train around the lake to Les Diablerets in the Alps. Before we left she asked us if we were afraid of heights or suspension bridges. Yes and yes. 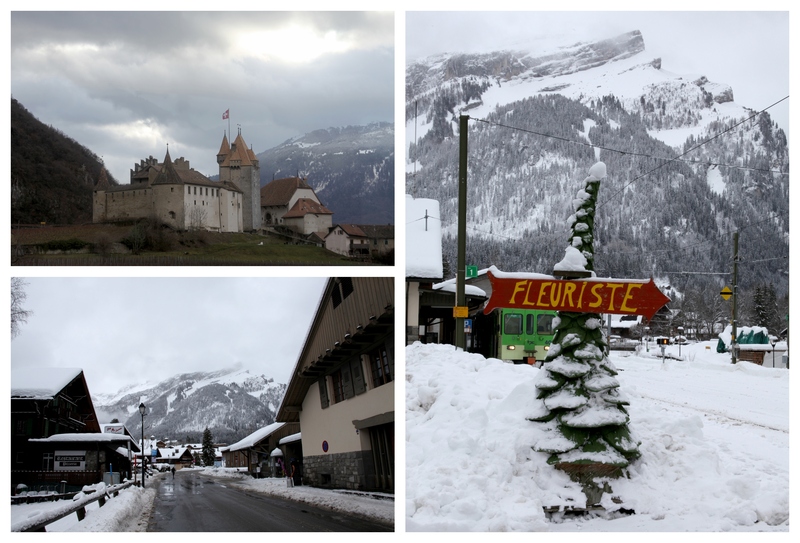 Les Diablerets is famous for the Peak Walk suspension bridge that connects two mountain peaks, the first of it’s kind in the world. Sounds like a nightmare, but I refuse to let fear get in the way of absolutely stunning views of the Alps. Unfortunately, the weather didn’t cooperate. Snow was rolling in as we took the smaller train that wound up to the village. By the time we arrived the bus up to the bridge was closed, and after a brief lunch to regroup, the entire area was closed due to heightened avalanche risk. We spent a bit more time in the village taking pictures before heading back down the mountain. It would sound like a wasted day, but the views from Les Diablerets made the trip worthwhile. Besides, now I have an excuse to go back. The day I left we saw something rare and beautiful for the Geneva winter: the sun. We had planned to go downtown to bum around the shops before I left but since the weather was so clear for a change we decided to take a drive up the hills across from Lake Geneva. On such a clear day this vantage point offered panoramic views of the city, as well as Mont Blanc and the Alps across the lake. 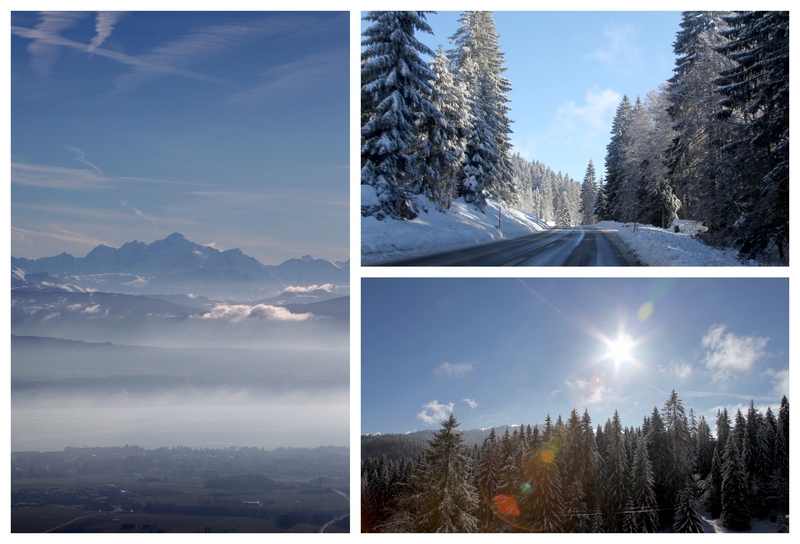 We continued driving to soak in the sun and clean mountain air and to admire the dense pine forest in every direction. 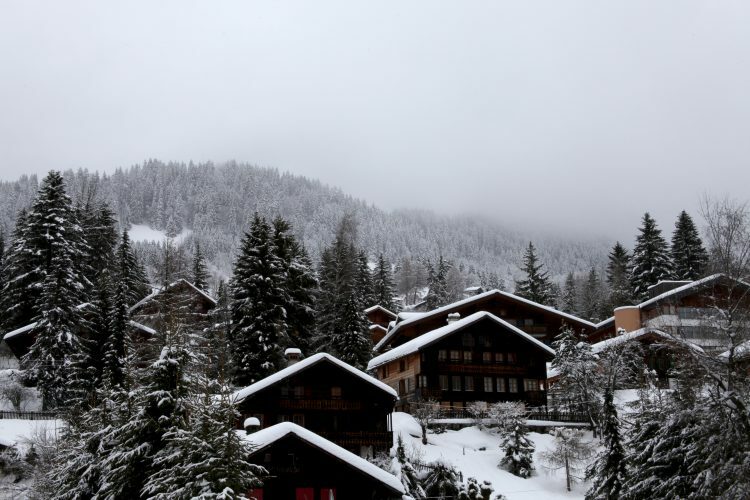 It felt so quintessentially Swiss, and those photos are more exciting to me than any souvenir I could have purchased. It was a quick trip, but a special one. From the little I saw, I feel confident saying Switzerland is absolutely stunning and has easily made it’s way to the center of my field of vision. Aside from that, I got to see some friends I haven’t seen in over a year. I didn’t realize how badly I needed them until we were together. We could have been in the most barren, unforgiving, “ugly,” place in the world and my soul would feel lighter after those four days, but being in such a beautiful city just made it all the sweeter. More on that part of the trip next week. Love it! And love you were willing to forgo fear and cross the world’s only peak to peak suspension bridge…I guess it wasn’t meant to be this time, but there is always next time, and there will be a next time even if not in Geneva, where I ask you to do something crazy with me.